The last time the New York Yankees were considered underdogs, a Walkman was the status quo for the cool kid on the block. A success story for the Yankees usually involves all their royalty coming together and the expected wins continuing to happen. This year has been different. Vernon Wells has been enchanted with being able to actually hit a baseball when he puts the pinstripes on. Lyle Overbay made the cut with his “tryout” and Travis Hafner has shown signs of his past power as well. The cast of unwanted, washed up players have compiled a 25-14 record, putting them tied with the Texas Rangers for the best record in the American League. 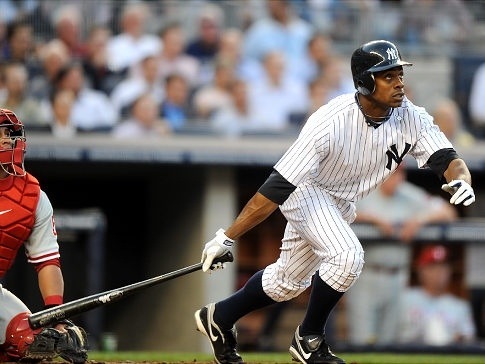 Now, All-Star center fielder Curtis Granderson is back after going 0-for-3 in the Yankees 4-3 victory over the Seattle Mariners. The question is: Do the Yankees even need Granderson? Joe Girardi now has the “problem” of having four outfielders fighting for time in three positions. He promises that all four outfielders (Granderson, Wells, Ichiro Suzuki and Brett Gardner) will play, but where does Granderson fit in now. Going into the year, Wells would seem to be the first one to sit after a horrid time with the Los Angeles Angels. The rejuvenation of Wells deserves to stay in the lineup. In 37 games, Wells is hitting .300 with nine home runs and 22 RBI. Gardner has returned from injury this season as the Yankees leadoff hitter. He is only hitting hitting .253 with six stolen bases, but brings defense and speed to the Yankees. Does this leave Ichiro as the lone man out? At age 39, he is only hitting .246 with a messily .289 on-base percentage. Suzuki is one of the most skilled hitters to ever put on a uniform and had a much better second half than first last season, but with the return of Granderson, his at-bats may be dwindling. Girardi will find a way to get all four outfielders at-bats, with the hot hand staying put. For now, the Yankees must continue what they are doing now and bring that same game once they are healthy. The scary part about Granderson’s return is that he is just the start of 10 players on the DL for the Yankees, looking to return. An astounding $85.6 mil. is on the DL for the Yankees right now. With All-Stars such as: Alex Rodriguez, Mark Texeira, Derek Jeter, Kevin Youkilis and Michael Pineda set to return this season, the Yankees can only get better. They owe their “replacement players” a big thank you for getting them to this hot start when most “experts” had them falling off the AL East map this season. This current team brings back memories of a team with the likes of: Scott Brosius, Tino Martinez, Shane Spencer and Chuck Knoblauch. New York may have needed the perfect amount of pinstripe past, before the real Bronx Bombers show up.